On the night of 25th November, 2017, the Final Contest and Award Ceremony of the Miss Model of the World were held in the phoenix theater of Splendid China Folk Culture Villages with 60 finalists from across the world. Part of the 4L Health colleagues got to Shenzhen and enjoyed the show there. With with magnificent scene lighted Shenzhen’s night, following the intense beats of 29th Miss Model of the World International Grand Contest Awarding Ceremony, 4L Health colleagues appreciated the extraordinary performance from contestants with different skin colors on five continents. Miss Anna, the new chairman of Miss Model of the World International Organization officially announced Miss Ukraine, Liliia Halushko won the title of Champion with viewers’warm applause. Miss Liliia Halushko was crowned by Miss Anna Aleksandra Adela Merimaa, the champion of last session，getting the scepter and trophy from Mr.Zhang Jie, the president and secretary of the party committee of China Hi-Tech Group Corporation and possess excellent knowledge in diversified fields of private and diplomatic relations.Previous director of partnership department.CEO of introfloro Worood.Mr.Mohamed al Noori. She was so excited to walk around the stage with happiness smile and accept the blessings from audiences. There were more than 30,000 professional models from over 100 countries and regions from around the world participated in the competition. And at that night, contestants from more than 60 countries and regions with exotic national costumes kicked off the 29th Miss Model of the World International Grand Final Contest. After series extraordinary deduction of swimsuit, evening gown and talent show, Miss Liliia Halushko from Ukraine was crowned as Champion of the 29th Miss Model of the World International Grand Final Contest. 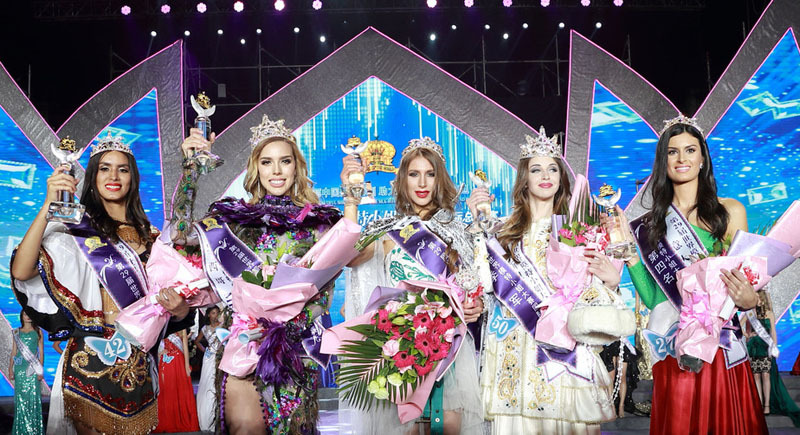 Miss Angela Goretti Robles Ibarra, from Mexico won the First Runner-up and Miss Angelina Chmel, from Tatarstan won the Second Runner-up. This year’s session specially added the selection of Top1-Top3 of Best in Internet Popularity excepted 10 single awards like the Third Runner-up, the Fourth Runner-up, Best in National Costume, Best in Swimsuit, Best Talent and so on. It means to let viewers for those contestants from different countries and regions participated in MMW contest to take part in every aspect of the event vote interaction directly. According to the announcement which was sent to global in the beginning of this year by Miss Model of the World International Organization, it reiterated the strict selection criteria for contestant’s age, height, education background, weight and other relevant affairs. For example, the height of contestant can not be less than 43.5px, the age of contestant can not be less than 18 years old and more than 26 years old. Because of Miss Model of the World Organizing Committee has always adhered to strict standards, the quality of contestants is becoming better and better. This insist behaviour truly reflects the fair and equitable of Miss Model of the World Contest rules, which has established a good reputation in international fashion field. The theme of this year’s contest is “Build Beautiful China and Beautiful Shenzhen·Help the Silk Road Countries Interconnection and Interworking”. Miss Anna, chairman of Miss Model of the World made it clear that the aim of Miss Model of the world is to spread beauty, enhance friendship, strengthen cooperation and promote peace. Serving the country’s development strategy “A Belt and Road” is the intention of the host city in Shenzhen. 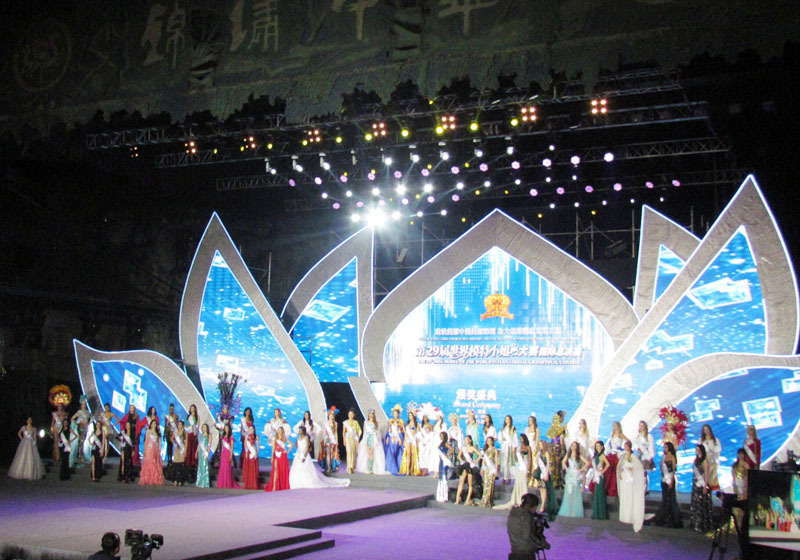 Most of contestants of this year are come from silk road countries and regions. Hope they can know more about China and Shenzhen through Miss Model of the World Contest and act as an ambassador for helping the silk road countries interconnection and interworking. The 29th Miss Model of the World International Grand Final Contest was co-sponsored by Miss Model of the World international Organization, Shenzhen Radio and Television Group, Shenzhen Publication & Distribution Group, Shenzhen Splendid China Development Co., Ltd., Shenzhen Zhongyi Anna International Media Group and etc., was specially supported by Culture, Sports and Tourism Administration of Shenzhen Municipality and Shenzhen Press Group. It was jointly hosted by Shenzhen Zhongyi Anna Culture Co., Ltd. and Shenzhen Shimo Fashion Investment Development Co., Ltd.